Hello Stampers! I love pairing kraft and red together for this Valentine's Day card. I did some embossing and stitching on the heart. The flowers are then added on top of the twine. This makes for a fun and quick card. 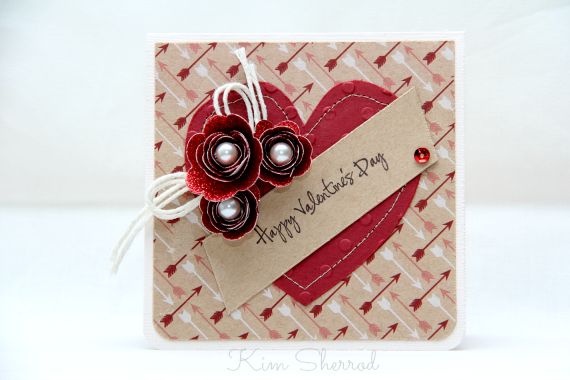 Love the paper, the pretty flowers with the glitter and the embossed heart! Thank you for playing along and sharing your talent with us at Crafty Catz this week. Good luck and hope to see you back soon. Great card, beautifully done, love the flowers. Thanks for joining us at QKR Stampede this week. This is beautiful, Kim! Love that background dp you chose. I'm putting on a DT hat now -- Thanks so much for playing at QKR Stampede this week. Good luck and I hope we see you again soon. :-D Miss you. Love the flowers and the stitching. Thank you so much for entering our flower challenge at Allsorts this week, hope to see you again! absolutely beautiful card! 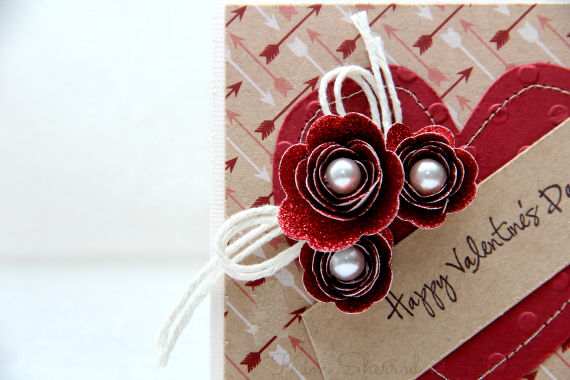 thanks for joining us for our aloha friday challenge - valentine's/love at kitty bee designs!